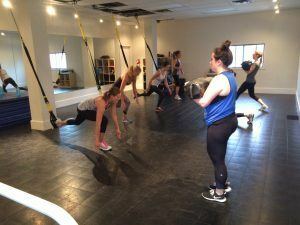 Join our bootcamp style TRX Classes Calgary, located in Marda Loop SW. These innovative classes optimize workouts, reduce fat and gain lean muscle as an example. 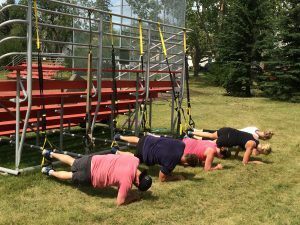 TRX Training is a functional bodyweight movement workout incorporating suspension straps. Other equipment utilized includes flat hooped resistance bands, kettle bells, sandbags, battle ropes, TRX Rip Trainer and medicine balls. Classes combine core integrated exercises designed to make gains in strength training. Classes promote metabolic conditioning, speed, flexibility, balance and comprehensive athleticism. Hit your goals in shorter time with our style of training. Learn how to use the TRX coupled with flat hooped resistance bands, achieving various fitness and performance goals. TRX is the ultimate way to improve functional strength & mobility in addition to balance and core stability. Group classes conducted in private training facility. Personalization in addition to progression suited to all fitness levels. Unique classes of intense group intervals over a 1-hour period of time. Neil H Jones created OPTIMUM HEALTH & FITNESS to provide education and lifestyle changes required to achieve health, fitness, and sport specific goals. As a result, OH&F is passion turned reality for Neil. Most notably, Neil’s training approach embodies his motivation to empower lifestyle re-creation in health and fitness. As well as empathize when it comes to understanding his clients needs thus showing them results! Our TRX classes include a dynamic warm up and activation to prepare for the workout and reduce risks of injuries. We would then move onto the main component of strength & conditioning together with power and explosiveness as well as agility & balance. TRX training is optimum fitness approach if your goals include melting body fat, gaining lean tissue or improve sports performance. Lastly – OPTIMUM HEALTH & FITNESS commits to guiding you along your journey to achieve your own personal results and goals specifically designed to meet your needs — inspiring you to transform and appreciate the many benefits of an active and healthy lifestyle.